Shakespeare’s Globe founder, Sam Wanamaker, had a vision to provide theater to all children. A mobile app Shakespeare’s Globe 360 carries out his primary purpose of this theatre by bringing history to life. Shakespeare’s Globe launched the app Shakespeare’s Globe 360 in 2015, which offers an interactive theatre experience to audiences through augmented reality (AR). This technology enables audiences to experience a virtual tour of the famous Globe Theatre in London, England. They can learn how the theatre was built and what theater life was like in 17th century. Due to the popularity of AR apps, like Pokémon GO, educational tools like Shakespeare’s Globe 360 have gained new purpose and relevance. With this app, students who are used to this technology have the chance to turn the Globe Theatre from an idea into an experience. Access to the Globe anywhere. Audiences do not have to be in London to access the Globe Theatre. The Augmented Reality Mode on Shakespeare’s Globe 360 brings the Globe to life. If a user taps the augmented reality button on the bottom left of the screen and points a device at the Shakespeare’s Globe logo, the Globe Theatre will appear right in front of the user. 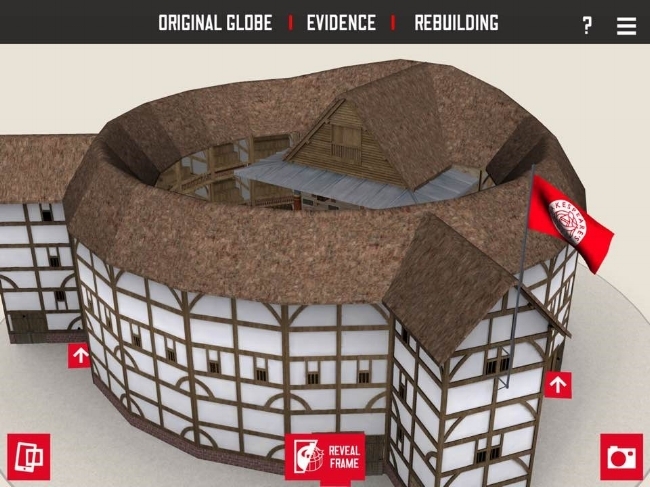 App users can view both the exterior and interior of the Globe Theatre in detail. At an exterior view, the users can learn about the parts that have been rebuilt. The app explains the architectural issues of the original Globe. Learning about the performing arts, alongside its history will provide new depth to the content of both arts and English classes. AR lets students explore the theatre and feel the atmosphere of it. Although it isn’t new technology, AR supports education in a way that was previously impossible. For instance, adding a virtual reality headset to this app will take the experience to another level, by bringing the user inside this historic theatre. Shakespeare’s Globe 360 enables audiences to access the theatre anywhere and see it at 6 different viewpoints: musician’s gallery, tiring house, stage, middle gallery, yard, and middle gallery. Each viewpoint has informational icons and videos that explain about the objects, rooms, and other architectural elements on each screen. According to the drama curriculum leader at Sarah Bonnell School, Natalie Jim, her studentstook control of their learning and explored the Globe at their own pace. She noted that her students were more actively engagaed and motivated in learning about the Globe Theatre than they were in other lessons. Shakespeare’s Globe 360 has a camera icon that users can use to take a screenshot at any point. Social media icons allow users to easily share screenshots of their experience. This is an invaluable extension of the educational capabilities of Shakespeare’s Globe 360 because it gives students a way to engage with the educational experience as well as keep a memento to better remember what they learned. Shakespeare’s Globe 360 is a step forward in enhancing arts education through technology. There are many applications of AR that non-profits, and arts organizations in particular, have yet to explore. Integrating this app with each performance, allows audiences to interpret and enjoy the show from various perspectives. Have you used any AR apps related with arts education? How do you see AR developing arts education further? Davis, Anna. 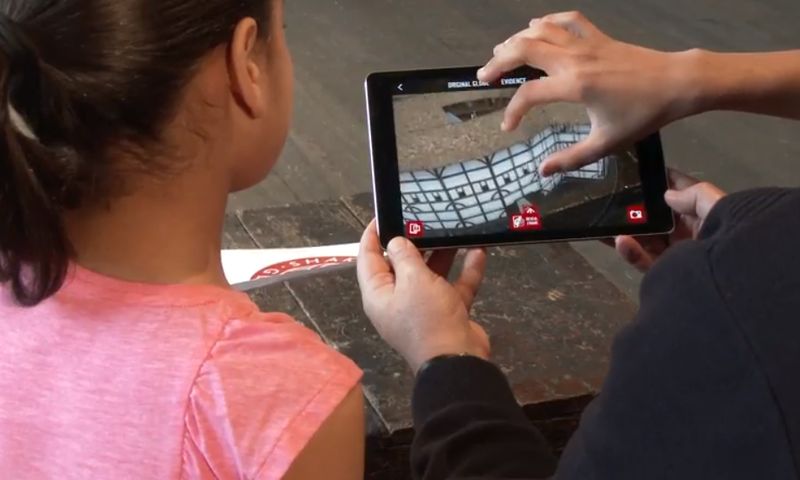 "Globe Theatre launch new augmented reality app." Evening Standard. April 27, 2015. 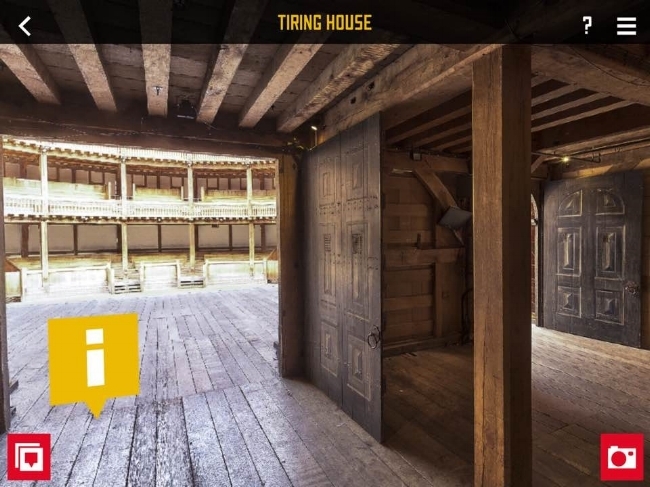 Accessed September 22, 2017. https://www.standard.co.uk/stayingin/tech-gaming/globe-theatre-launch-new-augmented-reality-app-10206563.html. Gurr, Andrew. "Globe Theatre." Encyclopedia Britannica. May 20, 2016. Accessed September 18, 2017. https://www.britannica.com/topic/Globe-Theatre. Hemley, Matthew. "Shakespeare’s Globe app offers virtual experience of theatre." The Stage. April 30, 2015. Accessed September 26, 2017. https://www.thestage.co.uk/news/2015/shakespeares-globe-app-offers-virtual-experience-theatre/.